Gabriel Arregui has appeared in recital with sopranos Julianne Baird and Rosa Lamoreaux, David Shostac (flute), John Thiessen (baroque trumpet) and Elizabeth Blumenstock (baroque violin). He has performed for Queen Elizabeth II, Prince Philip, and Robert Runcie,the late Archbishop of Canterbury. He has appeared for 22 seasons as a soloist and in chamber ensembles with the Baroque Music Festival of Corona del Mar and has taught 18th-century counterpoint at La Sierra University. 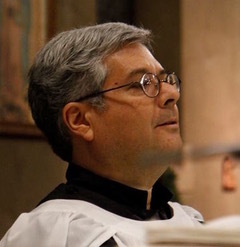 Presently, he serves as Sub-organist and Assistant Choirmaster of St Paul’s Cathedral, San Diego, California, where he has many opportunities to practice his latest passion: improvisation. Mr Arregui holds degrees from the University of Southern California (Accompanying and Collaborative Piano) and Loma Linda University (Organ Performance). His professors have included Gwendolyn Koldofsky, Brooks Smith and Jean Barr (Collaborative and Solo Piano), Anita Norskov Olsen (Solo Piano), Malcolm Hamilton (Harpsichord), and Donald J. Vaughn and Thomas Harmon (Organ).